March 2011 – Kitmeout Designer Clothes – Fashion Blog & Fashion Forum. at the Space 15 Twenty Complex. Jeans with the faded or worn out look achieved by sandblasting often retail for as much as 180% of the price of a normal denim. Yet the hidden cost is paid by sandblasting operators working in the countries such as Bangladesh, China, Mexico and Egypt, many of whom contract an acute form of the fatal lung disease silicosis due to fine silica particles gathering in the lung. The report, released by workers’ rights group Labour Behind the Label, states that in Turkey alone, 47 former sandblasting operators are known to have died as a result of work related silicosis before the practice was banned by the government in April 2009. Doctors suspect that as many as 5,000 Turkish workers may be suffering from unreported instances of the disease as a direct result of this killer fashion trend. “Still, actions taken by companies alone will not be enough to cover the entire sector. We encourage governments to look into a possible importation ban for these jeans”, added Ms Maher. Jeans brand Levi-Strauss and fashion giant Hennes & Mauritz (H&M), among others have made public statements in the last six months announcing that they will stop selling sandblasted jeans. Labour Behind the Label are today joining an international call to demand that all jeans brands stop selling sandblasted products with immediate effect, and take responsibility for workers already affected by performing medical checks and providing compensation for affected workers. Consumers are also encouraged to tell their favourite brands they won’t accept the practice of selling killer jeans. Hans Ubbink designs contemporary clothing with a twist, and while the Netherlands is very dear to Hans. Ubbink has something to add on a global level. iFly Magazine followed Hans for a day and discovered his unique world. Watch the video! Vogue Italia have launched a campaign against blogs and social networking sites which promote anorexia. The magazine is giving readers the chance to get involved and support the campaign by signing a petition on their website. The publication has teamed up with Association for Eating Disorders to fight against the growing number of online secret diaries that list details and instructions on how to lose weight and develop anorexia. These include interactive applications, which count calories, encouraging pictures of extremely thin style icons, and unnaturally quick weight loss measures. To show support click here. The Council of Fashion Designers of America has chosen its 2011 CFDA Fashion Awards nominees and honorees. Alexander Wang, Jack McCollough and Lazaro Hernandez of Proenza Schouler and Marc Jacobs will be competing for this year’s Womenswear Designer of the Year award. This year’s nominees for Menswear Designer of the Year will be decided between Michael Bastian, Patrik Ervell and Simon Spurr. The Accessory Designer of the Year nominees are Reed Krakoff, Alexander Wang and McCollough and Hernandez of Proenza Schouler. Nominees for the Swarovski Award for up-and-coming talent are Joseph Altuzarra, Ashley and Mary-Kate Olsen and Prabal Gurung for women’s wear; Alexander Wang, Philip Lim and Robert Geller for men’s wear, and Alejandro Ingelmo, Eddie Borgo, Jason Wu and Pamela Love for accessories. This will mark the 10th year that Swarovski is underwriting the awards gala, which will take place on Monday, June 6 at Lincoln Center’s Alice Tully Hall. As in previous years, the night will also be an occasion for the CFDA to hand out several special awards. Marc Jacobs will receive this year’s Geoffrey Beene Lifetime Achievement Award. Lady Gaga is being recognized with the Fashion Icon Award, while Phoebe Philo for Celine will take home the International Award. Meanwhile, the Eugenia Sheppard Award will go to Hilary Alexander of London’s Daily Telegraph, while Hal Rubenstein of InStyle is being honored with the Eleanor Lambert Award. This year’s CFDA Board of Directors’ Special Tribute Award will be given to Arthur Elgort in recognition of his impact on fashion and photography. The nominees and honorees were announced at CFDA president Diane von Furstenberg’s studio. Stronghold was the first denim company in Los Angeles, California, when it opened for business in 1895. It closed in 1949 only to reopen under the ownership of Michael Paradise and Michael Cassel in 2004. They vowed to retain every bit of the authenticity of the original company, both in its vintage quality and its production techniques. The 14 ounce denim is shuttle-loomed in Japan, where American’s sent their old denim looms after the war. Stronghold’s weavers use organic cotton and organic indigo. The bolts of denim are then cut, sewn, and finished in Venice, California. Plant-based indigo dye has been around for centuries. Traces of its are hue found on Persian rugs dating as far back as the 5th century B.C., but due to its expense fell out of use in denim work wear in the 1960s. The rare, deep purplish blue color so closely associated with denim was replaced by sulfur dye, which doesn’t retain its richness quite like indigo. The organic dye used on the shop aprons does not fade, even after several washes. Georgia May Jagger has just launched a collection of jeans with Hudson and to celebrate, a stampede of eager shoppers arrived at Selfridges to meet the lady herself. While there, Grazia took the opportunity to grill GMJ on all things denim, and find out what she steals from her mum’s — and dad’s! — wardrobe. Christopher Bailey, Burberry Chief Creative Officer, spoke at the Oxford Union last night, one of Britain’s oldest and most prestigious debating societies. Having gained a worldwide reputation for its debates, the Oxford Union has a long history of hosting international figures such as Albert Einstein, Winston Churchill and former US Presidents Richard Nixon and Ronald Reagan. In conversation with an audience of 450 students, Christopher shared personal and professional experiences from his upbringing in Yorkshire to his career at Burberry, where he joined 10 years ago. 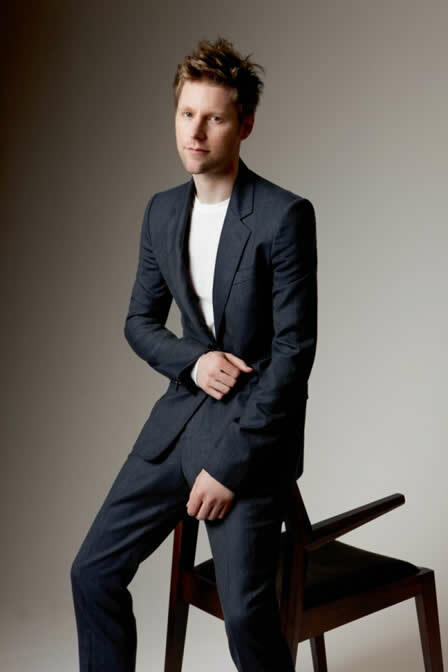 In his role as Chief Creative Officer of Burberry, Christopher Bailey is responsible for the design of all Burberry collections and products, as well as all advertising, corporate art direction, architectural design, multi-media content and overall brand image for Burberry. The extraordinary images will launch across style magazines and European billboards in March 2011. Burberry SS11 runway sprayed leather tote and messenger bags. All of the bags are hand sprayed at the edges to create a rich dégradé effect. The leather has been chrome tanned, treated with vegetable oils then tumbled to soften the surface. The tote bags are available in black, sage, and tan, and are valued at $1,695.00. The sage messenger bag is available in sage and valued at $1,495.00. The new Kitsuné Spring/Summer 11 collection is inspired by Michelangelo Antonioni’s 1975 film “The Passenger”: the effortless elegance of Jack Nicholson’s character – his jeep stuck in the desert, checked shirt tied around his waist and a tiny hat to protect him from the blistering sun, alongside the wonderful frivolity and superficiality of Maria Schneider’s character. Band of Outsiders was formed in January 2004 in Los Angeles, California by Scott Sternberg. The core collection of re-interpreted American menswear classics sells in over 65 boutiques around the world. Boy by Band of Outsiders is the first in an ever-growing series of micro brands from Band of Outsiders. Launched in July 2007, Boy takes its cues from traditional men’s tailoring and fabrics, offering a full collection of button-down shirts, shrunken blazers, waistcoats, overcoats, sweaters, and trousers, all re-examined and re-invented for women. Like its brother-brand, each of Boy’s tailored pieces are hand-made by the craftspeople at Martin Greenfield Clothiers, a 100 year-old tailoring factory in Brooklyn, New York. Infusing this type of craftsmanship and tradition into women swear is a key tenant the Boy concept. Burberry announces new cast members for March, Tali Lennox and Tara Ferry as part of its dynamic ad campaign for Spring Summer 2011, where new British cast members are revealed each month. Shot on Brighton Beach by Mario Testino, British models Tali Lennox and Tara Ferry will feature across print and online media for the month of March. Launched with January couple British models Cara Delevingne and Jacob Young and featuring British models Jourdan Dunn and Sacha M’Baye in February, the campaign reinforces the brand’s synergy with British landscapes, weather and emerging talent. New for the Spring/Summer 11 Griffin Collection we been working closely with our Italian dye factory to create a spray-paint technique which could feature across a limited edition range of garments. The hand applied technique is applied after the garment has been manufactured, placed on an industrial mannequin – the dye affect is then applied across the entire garment, this means the dye can only reach the areas immediately exposed leaving the underneath of pockets and inside of cuffs completely untouched. This hand-applied technique ensures each garment is completely unique and gives a worn, plastic finish to the Italian cotton fabrics. We have produced just 50 Limited Edition pieces of each style, there are four styles available including the Imber Jacket, the Flying Pant, the Archback Trouser and Short. To celebrate the new look Meltin’Pot E commerce shop and a new year in which Meltin’Pot is going to say goodbye to the past and a big HELLO to the future, Meltin’ Pot presents STYLE ME UP. Style Me Up embraces the individual and international creative talent of 12 different bloggers/stylists, creating a 12 month calendar of unique and culturally diverse Meltin’Pot looks, together with hot styling tips for the seasons ahead. 10 TokyoDandy styling tips for the season. 1) Turn up collars, roll up sleeves – fit your clothes to your body. 2) Chromophobia is the fear of bright colors – this is unacceptable -embrace color! Even just a little with a bright tie or pair of socks, or if you’re really daring your hair. 3) Cut off jean legs in Summer for the comfiest pair of shorts…..
4) Then wear your favorite shorts all-year round over a pair of leggings. 5) Beg, borrow and steal clothes and jewelry from friends – sharing is caring and everything looks different on each individual. 6) Japanese street fashion is popular because of the amount of mixing and matching it involves, with just a little imagination you can get so much more out of your wardrobe. 7) Wash your hair. The 90’s maybe having a revival but some things from the grunge era are best left in the past. 8 ) Studs are here to stay but be inventive, search out flat studs and shapes other than the traditional spike shape. 9) Don’t follow trends when it comes to jeans, it’s essential you wear the style that is right for your body. 10) Ignore all above the above. Style tips are like fad diets, there are no quick fixes and if you thin about it you know what’s good for you. Product : Standard Unbranded Artisinal Denim. Mission: benchmark indigo product available at a competitive retail price point. Nil says : ”Build-quality is the yardstick to gauge good denim & know-how is the only tool of this trade. high standard,regulation denim, sold with absolutely no branding distractions at affordable prices. 10.DEEP SPRING 2011 PREVIEW from 10 Deep on Vimeo. A quick preview look behind the scenes of the shoot for our Spring 2011 10.Deep lookbook. Established in 1995 by native New Yorker Scott Sasso, 10.Deep remains equally vital from streets to the boutiques (including stints at Colette, Union and Fred Segal) and the music community that it came up alongside of. As one of the original New York streetwear brands, our motto is simple: forget everyone and listen to yourself. Strength lies in the hands of an individual (10 fingers), not in the approval of one’s peers. Six top Japanese designers graced Rendez-Vous NYC. Exhibiting under the auspices of Japan Fashion Product Organization (Japan-FPO), Anrealage, Gasbook, Isolde Richly, Klasica, Rusty Thought and Shida Tatsuya unveiled their latest collection to the New York fashionistas. With 80 international progressive brands and designers showing, RENDEZ-VOUS NYC has become a must-visit exhibition during the New York fashion season. Held during the whole month of February, wherein 10 days coincides with New York Fashion Week, RENDEZ-VOUS NYC attract press and buyers alike to its halls. As an exhibitor the show and venue offers a coherent selection of like minded collections in a pleasant and uncrowded space, allowing buyers to view collections in a ‘showroom’ feel and to be able to work with a certain amount of privacy. Burberry dressed the following guests who attended the 83rd Annual Academy Awards in Los Angeles, California.